Birds love to eat millet spray and need added calcium for their ovearall health. Birds love to eat millet spray and need added calcium for their overall health. To make it extra tasty, we blended in pure strawberry that birds will find simply irresistible. 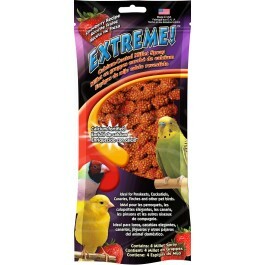 Our nutritious and healthy treat stimulates the natural foraging instincts and helps relieve cage boredom. Millet Spray, Calcium Carbonate, Strawberry Juice Powder, Maltodextrin, Gelatin, Honey, Color Added (Red 40).